This is a big topic and something that a lot of gardeners either think that they don’t have to know or are just plain scared of!. Let me just say that a basic grasp of this fundamental knowledge will help you to solve many of the problems that you will be faced with as a gardener – believe me, I know – I learned the hard way! Bear with me because I have a BIT OF EXPLAINING TO DO. Now, now Flossie – I didn’t say ‘bare’ with me! It all started for me this week with an email from Peter – a member of our Garden Club who has undertaken an Organic Horticulture course at College. NOTE: It was explained to me by Peter that they had spent the past few weeks planting out a large area with annual vegetable crops in the traditional farming practice of segregated rows. Dear Peter,Feeding crops. This is an interesting point you make and something I have been meaning to write up on the blog as people find it perplexing.People always seem surprised when I talk about the necessity for feeding the soil – particularly if the pH is OK and they have improved it with OM. However, when you think about it it makes sense – especially when your are talking about veggies and fruit crops. WHAT:You can get a grasp on this if you think of plants being like people – we need food, water and air to survive – without them we won’t flourish – plants are the same. We have OUR macronutrients (proteins, fats and carbohydrates) and we need larger amounts of them than our micronutrients (vitamins and minerals) – BUT THEY ARE ALL ESSENTIAL – in this respect plants are also the same – they have their MACRONUTRIENTS and MICRONUTRIENTS – they need them all to survive, but some in larger quantities than others. OXYGEN, CARBON AND HYDROGEN make up 96% of these – which plants get from the air, sunlight and water. However, just as essential for healthy plant growth is the presence of a range of chemical elements that plants get from the soil – NITROGEN(N), PHOSPHORUS(P) and POTASSIUM(K). Unlike us, plants can’t go grazing for the nutrients they need, they have to be within their root zone. In nature these elements occur naturally- provided by the soil and decomposing plant and animal material and, in the natural environment if these elements are scarce for some reason, plants evolve to survive without them. For example – Australian soils are very low in phosphorus and many native plants will not thrive in phosphorus rich soils and you cannot feed them phosphorus rich fertilizers. Nowhere in nature does anything exist like your vegetable garden. This is an area of intensive crop production, and you are probably using the same piece of ground over and over again – SO THE SOIL AND PLANTS WILL NEED REGULAR FEEDING if they are to flourish. Pot 1. 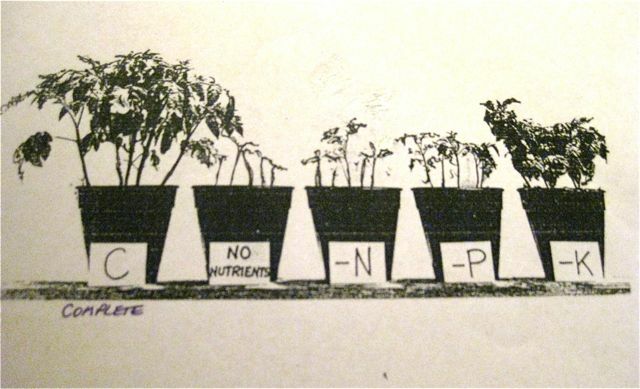 C – Complete – this plant had all the N, P, K it needed. Note the healthy, normal growth. Pot 2. Had no nutrients at all – notice the stunted, poor growth. Pot 3. -N – no nitrogen. The function of nitrogen is to promote strong, healthy leaf growth. Plants that are grown mostly for their foliage, such as leafy green vegetables, will require a fertiliser higher in nitrogen. If a plant’s leaves begin to yellow there’s the possibility of nitrogen deficiency. Pot 4. -P – no phosphorus (phosphates). This is responsible for the reproductive parts of the plant – the flowers, fruit and seeds and is also important in root development. NOTE: As a kid, on my father’s alottment I used to watch him put in a trench of wood ash next to where he was going to plant a root crop. He didn’t know that this would be ideal food for them – he had just watched someone else do it and seen the results. 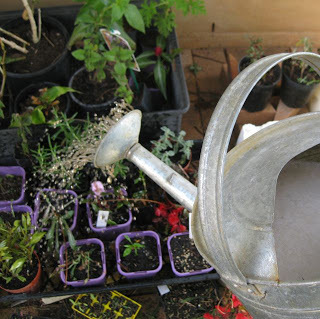 Observation – one of the keys to successful gardening. Pot 5. -K – no potassium (potash) Essential for the formation of sugars, starches, carbohydrates, protein synthesis and cell division. Enhances flavour, flowering and setting of fruit. Other important elements are calcium (Ca), magnesium (Mg) and sulfur (S). MICRONUTRIENTS are needed in small amounts like boron (B) which is needed by citrus to prevent fruit drop and to prevent hollow stems in broccoli. Peas and beans won’t thrive without molybdenum (Mo). FACT: ORGANIC MATTER is Natures’ ‘slow release’ fertilizer. How do these nutrients become available to the plants? They are mostly converted by bacteria to a soluble form that is taken up by the roots of plants. BUT THESE MICROFLORA IN THE SOIL ARE ONLY ACTIVE WHEN THE pH is right – that is NEUTRAL 6.5-7. So it is important to check your pH (see top of main page (UNDERSTANDING SOILS). 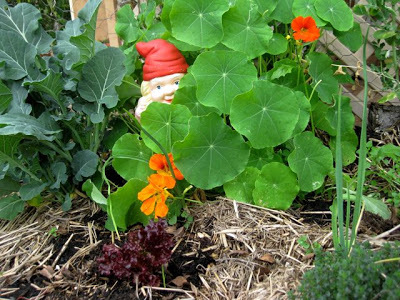 All the food your plants need may be present in your soil. but unavailable because the pH is either too acid or too alkaline. If you look at the diagram above (another of my College notes that I wish I hadn’t chucked out!) you will see that the widest parts of the shaded areas indicate maximum availability of each element. 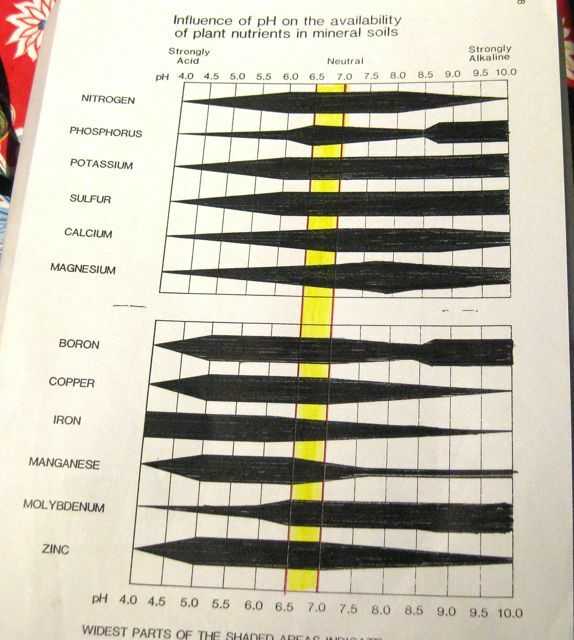 The YELLOW BAND INDICATES WHEN ALL OF THE ELEMENTS ARE AVAILABLE – 6.5-7 with the MACRO NUTRIENTS, in particular, decreasing as the soil becomes more acid. WHEN: Sub-tropical soils (and sandy soils) quickly become depleted of nutrients after heavy rain so our soils need feeding on a more regular basis. The general ‘rule’ is to apply nitrogen, phosphorus and potassium at the beginning of the growing season to encourage vigorous growth, and again at end of the growing season so they go into their dormant period in a well fed condition. Heavy rain also makes the soil MORE ACID because the alkaline elements in the soil are more soluble in water – they quickly get washed away. That’s why it’s important to check the pH and correct any imbalance. Mulch, mulch and more mulch! One of the very best ways to ‘quickly’ feed a plant is to use a home made COMPOST TEA (see previous post) as a foliar spray – that is directly onto the leaves. The plant is able to respond much more quickly to being fed by this method rather than via its roots and the soil. I give my fruit and vegies a feed this way about every ten days. NOTE: I make my COMPOST TEA from seaweed(kelp), comfrey leaves, and cow manure – this provides all the nitrogen, phosphorus, potassium and trace elements that my plants may need. 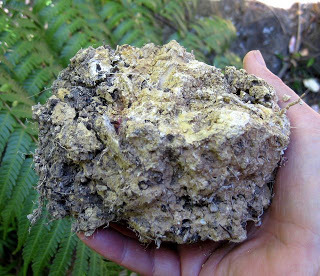 Six years ago I inherited this terrible clay ‘pudding’ – you can’t call it soil. I nearly wept. The developers had scooped off metres of beautiful rich top soil to level it. Everything struggled to live here, including me! With the help of these and the other millions of micro and macro flora in the soil – they just need lots of organic matter to do the work for you. 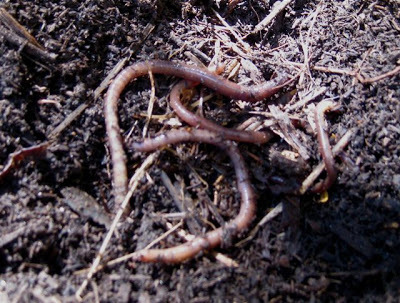 See Previous Posts: IN PRAISE OF THE HUMBLE EARTHWORM, UNDERSTANDING SOILS, COMPOST TEA, COMPOSTING, HOT COMPOSTING, IT’S RAINING, IT’S POURING NITRATES. “A cup of soil contains about 100 billion microorganisms. This is ten times the number of stars in our galaxy. 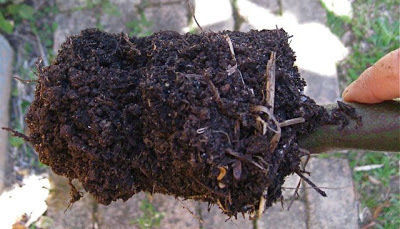 Just a spoonful of soil contains about a billion microorganisms” ABC Radio National Science Show 5/3/2012 In our lifetime we will never know everything there is to know about the complex inter-reltionships of nutrients in either the soil or our own bodies. Thanks Blake. Understanding this stuff makes me so excited. It’s like unlocking Pandora’s Box! Happy gardening.